Now living on opposite coasts, Mia is Juilliard's rising star and Adam is LA tabloid fodder, thanks to his new rock star status and celebrity girlfriend. When Adam gets stuck in New York by himself, chance brings the couple together again, for one last night. As they explore the city that has become Mia's home, Adam and Mia revisit the past and open their hearts to the future - and each other.Told from Adam's point of view in the spare, lyrical prose that defined If I Stay, Where She Went explores the devastation of grief, the promise of new hope, and the flame of rekindled romance. 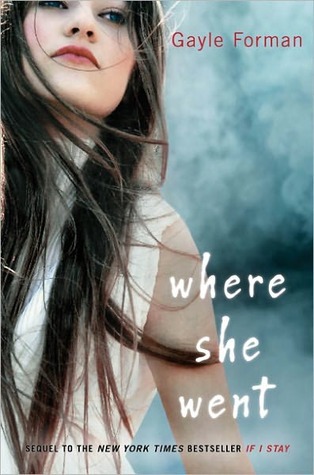 Summary taken from the Where She Went, Goodreads page. If I Stay is easily one of the best books I've read not just in 2011 but ever. That is because never before have I read such a beautiful story. It truly was beautiful in every aspect, especially the writing. Gayle Forman's writing has this sort of majestic quality to it that I just devoured. So I was obviously super excited to read this one. And to make things even better this one is written in Adams point of view. Let's talk about Adam for a second. In If I Stay, I loved Adam. I found him to be one of the nicest and sincerest male characters in young adult books period. No competition. Teenager's are known for being fickle, primarily when it comes relationships. So I was very happy to find Adam love for Mia and their relationship as something so real. In this book I was instantly hooked by Adam. It was like his grief was my grief. I truly felt for him and understood him. After seeing the story through his eyes, Adam has become and even more special character to me. "But I'd do it again. I know that now. I'd make that promise a thousand times over and lose her a thousand times over to have heard her play last night or to see her in the morning sunlight. Or even without that. Just to know that she's somewhere out there. Alive." I know that it can't possibly be easy to let go of the one person that you love over everything else. And the fact that Adam loved Mia enough to let her go if it meant that she would live is truly remarkable. Although this book is fiction, it felt real. Gayle Forman captured real human feeling. And that is not an easy thing to do. But it shows how talented Gayle Forman really is. What else can I say. I'm afraid that Where She Went is one of those books that no matter how hard you try to explain its magnificence, it just can't be done. In order to truly understand how completely wonderful this book is. You much read it and know for yourself, there is no other option. Awesome review! I absolutely ADORE this book. I read it months ago but haven't been able to post my review yet because I just feel like it doesn't do it any justice at all. Plus it's just full of lots and lots of gushing and sighing, haha.